You’ve survived back to school, possibly back to work; you’ve gotten your family back on a consistent routine, and those long, lazy days of summer are starting to feel like a distant memory. It’s back to business and you are running a tight ship again! But just around the corner is another challenge that can throw your baby or toddler’s routine for a loop: the end of Daylight Savings Time. In the U.S. we will “Fall Back” on November 6th and in Europe, clocks will change on October 30th. I know you may be worried that the time change will put a wrench in your family’s schedule. So, today we will talk about what to expect and help you find the best strategy for your baby or toddler. Take it easy. If your child is adaptable and generally consistent on most days, you can simply stick to your regular schedule. 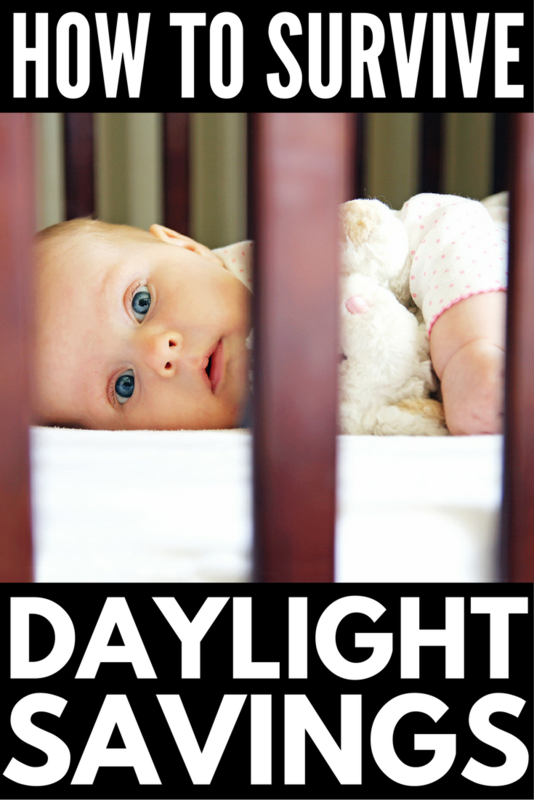 Let’s say your baby is waking at 7 a.m. and going to bed at 7 p.m. When the time change happens, your clock will say 6 a.m., but to your baby this will be no different than the previous day. At bedtime, you can continue to put your baby or toddler down when the clock says 7 p.m., even though for him it may feel like 8 p.m. They may be a bit more tired than usual, at first, but in a couple of days they will adapt. This works well for babies or toddlers who are not overly sensitive to being overtired and will get them back and settled into their regular routine in just a day or two. Be proactive. If your baby or toddler is not quite as adaptable and often sensitive to changes in schedule, you may want to be more proactive and help nudge them in the right direction. With this strategy you would slowly “nudge” their schedule over the course of a few days before the time change. On Wednesday, 4 days before your time changes, put your baby or toddler to bed 15 minutes later than usual. The goal is that they also wake up 15 minutes later in the morning, although this may not necessarily happen right away. The next day you will also want to offer naps 15 minutes later than usual to keep the whole schedule moving. Continue putting your child to bed 15 minutes later each night until “Fall Back” night, and by the time the clock changes, you would have shifted his entire schedule by 1 hour. This way, when the clocks change, you will be back to your normal schedule. The drawback for the more sensitive babies and toddlers is that this strategy can have a cumulative effect and they can end up becoming overtired, possibly leading to crankiness, early morning wake-ups, night-wakings and short naps. Play it by ear. If your baby or toddler is more on the inconsistent side and seems to adapt in some situations, you can take it each day at a time. With this strategy you would keep her on her regular schedule leading up to the time change and when the clocks fall back, take a flexible approach and shift her schedule as much as she seems to be able to handle on that day. If the goal is to get back to a 7:30 pm bedtime, you may only be able to get up to 6:30 p.m. at first. The next day she may be able to stretch to 6:45 pm. If you stay with it she will adjust in a few days. The drawback of this strategy, is that it can be challenging for those with babies or toddlers who are already waking up very early. If this sounds like your baby or toddler, I would suggest shifting their schedule in the 3 weeks leading up to the time change, and again, a week or so after the time change (if you are working to change the 5 a.m. wake-up). While Fall Back can throw a wrench in your schedule, consistency is key. For more sleep help, including tips to promote sleeping through the night you can put to use all year long, check out our free e-Book, 5 Ways To Help Your Baby Sleep Through The Night! If you want to have a library of resources at your fingertips as your child grows and you grow your family, you can also check our Members Area, where we have an e-book devoted to the topic of how to shift your child’s schedule, as well as a recorded tele-seminar with yours truly all about sorting out schedule problems. In addition to many other resources, we also have a custom schedule generator for all ages where you can simply input your child’s age and instantly receive a custom schedule, including feeding times. Join now through October 31st and receive 10% off our exclusive if you use coupon code MERAKI10. If you find you need more help, join us in one of our live chats with a sleep consultant! You’re never alone in your journey to better sleep! If you found these tips for dealing with the end of daylight savings time and kids, please share it on Pinterest! And if you’re looking for more sleep-related tips and tricks, please follow our Sleep board where we share all kinds of fabulous tips and tricks!